tively. 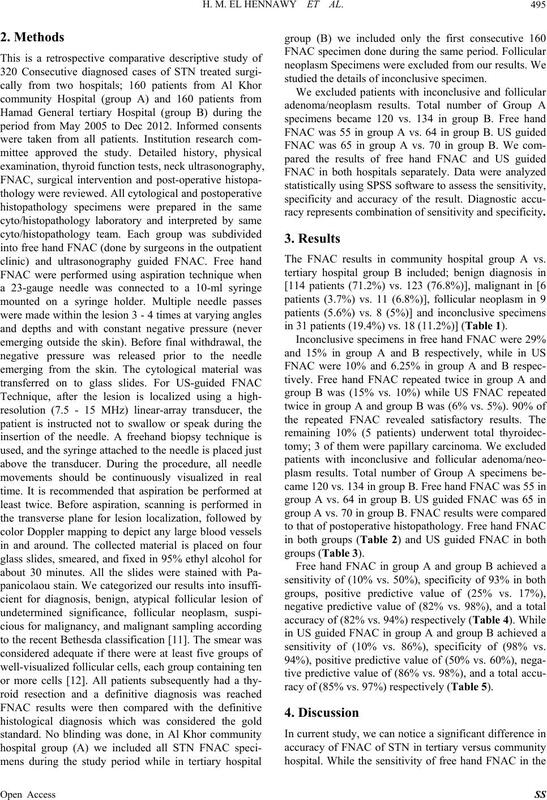 Conclusion: The overall accuracy of FNAC of STN in tertiary hospital was better than community hospital. More training is required for community hospital staff. reported prevalence of 4% - 7% of adult population. ules is to identify nodules with malignant potential . of incidentally discovered thyroid nodules is rising . studied the details of inconclusive specimen. racy represents combination of sensitivity and specificity. The FNAC results in community hospital group A vs.
in 31 patients (19.4%) vs. 18 (11.2%)] (Table 1). sensitivity of (10% vs. 86%), specificity of (98% vs.
racy of (85% vs. 97%) respectively (Table 5). H. M. EL HENNAWY ET AL. Table 1. Results of FNAC. Table 2. Free hand FNAC. TN: true negative; FN: false ne gative; TP: true positive; FP: false positive. Table 3. US Guided FNAC. had higher negative predictive and total accuracy values. nodule, follicularaden oma, and follicular carcinoma . Table 4. Free hand FNAC. Table 5. US guided FNAC. to avoid this limitation as much as possible. which make diagnosis extremely difficult [20,21]. with other series that ranged from 0% to 8% . (>15%) should be identified and given r emedial training. ules more often are cystic and contain necrotic areas. hospitals were comparable with published data [31,32]. guided FNAC was higher in tertiary hospital (97% vs.
crinology, Vol. 1, 1991, pp. 194-202. Medicine, Vol. 125, 2001, pp. 484-488. Surgical Research, Vol. 170, No. 1, 2011, pp. 48-51.
in Medicine, Vol. 17, No. 8, 1998, pp. 487-496.
tologica, Vol. 49, No. 4, 2005, pp. 378-382. Fine Needle Aspirations,” Diagnostic Cytopathology, Vol. 17, No. 6, 1997, pp. 422-428. 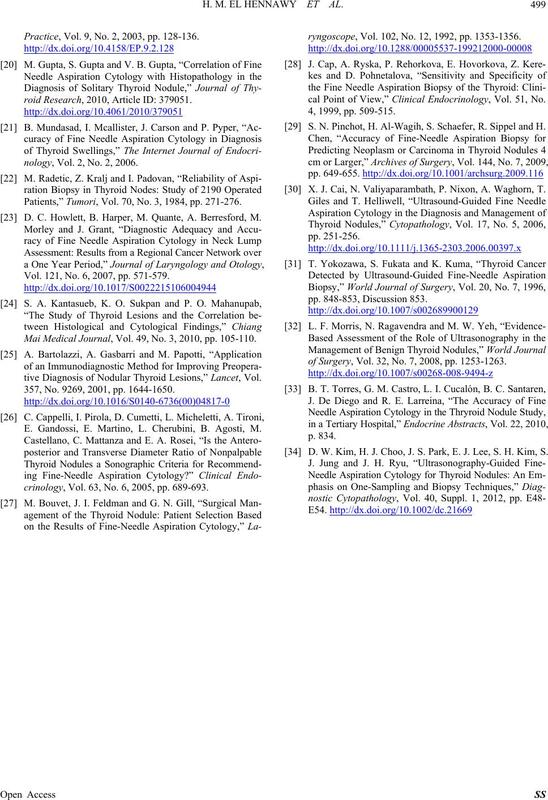 Z. W. Baloch, M. J. Sack, G. H. Yu, V. A. Livolsi and P.
porting Thyroid Cytopathology,” Thyroid, Vol. 19, No. D. C. Howlett, B. Harper, M. Quante, A. Berresford, M.
Otology, Vol. 121, No. 6, 2007, pp. 571-579.
navica, Vol. 154, 1988, pp. 93-96. B. Degirmenci, A. Haktanir, R. Albayrak, M. Acar, D. A.
Material,” Clinical Radiology, Vol. 62, No. 8, 2007, pp. Practice, Vol. 9, No. 2, 2003, pp. 128-136.
roid Research, 2010, Article ID: 379051.
nology, Vol. 2, No. 2, 2006. Patients,” Tumori, Vol. 70, No. 3, 1984, pp. 271-276. Vol. 121, No. 6, 2007, pp. 571-579. Mai Medical Journal, Vol. 49, No. 3, 2010, pp. 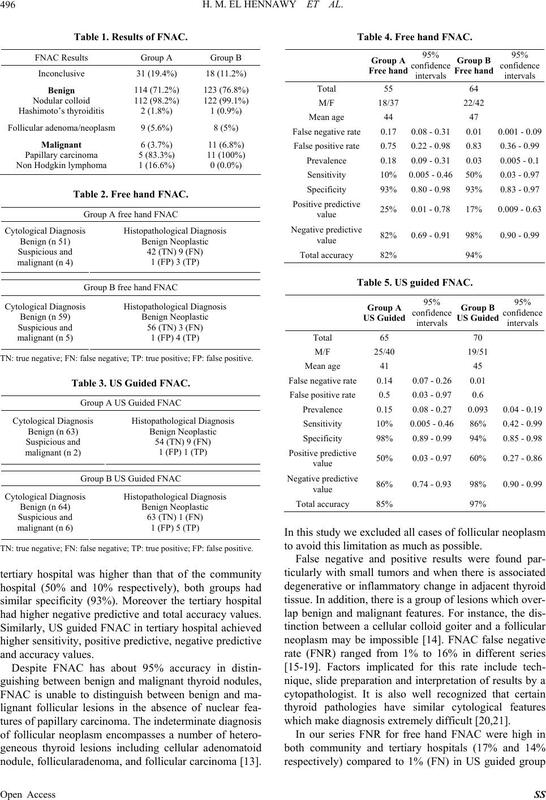 105-110.
tive Diagnosis of Nodular Thyroid Lesions,” Lancet, Vol. 357, No. 9269, 2001, pp. 1644-1650. E. Gandossi, E. Martino, L. Cherubini, B. Agosti, M.
crinology, Vol. 63, No. 6, 2005, pp. 689-693.
ryngoscope, Vol. 102, No. 12, 1992, pp. 1353-1356.
cal Point of View,” Clinical Endocrinology, Vol. 51, No. 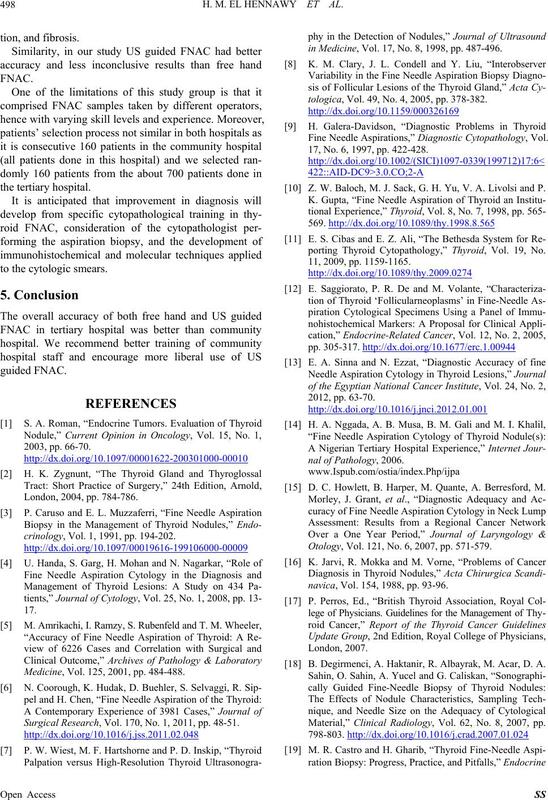 S. N. Pinchot, H. Al-Wagih, S. Schaefer, R. Sippel and H.
 X. J. Cai, N. Valiyaparambat h, P. Nixon, A. Waghorn, T.
of Surgery, Vol. 32, No. 7, 2008, pp. 1253-1263. D. W. Kim, H. J. Choo, J. S. Park, E. J. Lee, S. H. Kim, S.